Last year, Infor's CEO Charles Phillips took the stage with Salesforce.com's Marc Benioff to announce a partnership between their two companies. Coming in the midst of all the other announcements during Dreamforce, it would be easy to miss the significance of this one. Out-of-the-box integration. Today's announcement is for a new software product, Inforce Everywhere. 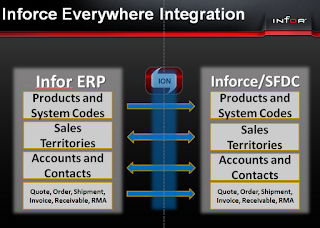 This is a native Force.com application that will make back office data from Infor's various ERP systems available to users within Salesforce.com's CRM applications. 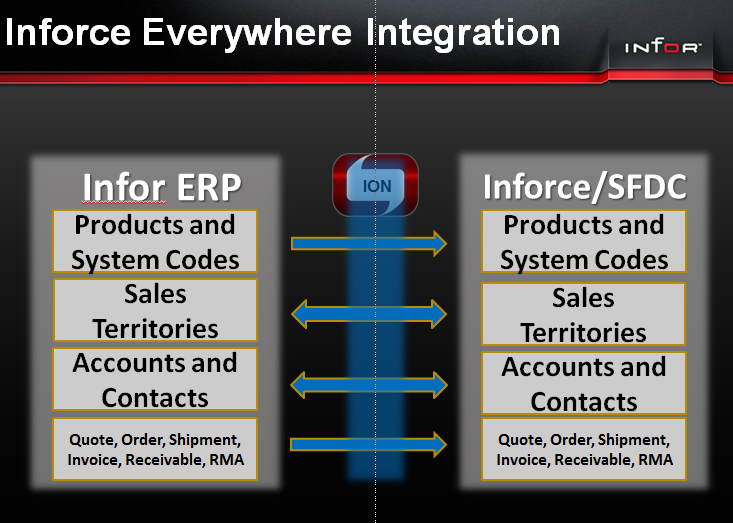 It also makes key Salesforce.com entities available within Infor ERP, as shown in the graphic nearby. See today's press release for more details. Additional products in the Inforce series are due out over the next 18 months. Reseller relationship. As announced at Dreamforce, Infor is now a reseller of Salesforce.com's Sales Cloud and Service Cloud, one of only three third-parties to attain this status. (The other two are Intuit and Dell.) This means that Infor can now sell SFDC and deliver first-level support to Infor's own customers. Financial commitment. Also, as announced at Dreamforce, Salesforce.com has become a financial investor in Infor. Salesforce has skin in the game. Taken together, these three commitments mean that the partnership between Infor and Salesforce.com is much more than the typical tech industry "Barney Partnerships" (I love you, you love me) that never go much beyond the press release and perhaps a few joint deals. On the surface, the two may appear to be strange bedfellows: Infor, commonly seen as a roll-up older enterprise software companies, and Salesforce--the hot young leader of a new breed of cloud apps providers. But dig a little deeper and you can see how this relationship--which has real and substantial commitments--makes a lot of sense for both parties and for their joint customers. What's in It for Infor? By teaming with Salesforce, Infor gets immediate credibility in cloud computing. Rather than build its own true cloud-based sales or customer service functionality, Infor joins forces with the leader in this market space. There's not much product overlap. Interestingly, although Infor has dozens of products in its portfolio, it does not have a best-of-breed CRM offering. Several of its ERP offerings, such as LN and Syteline, have their own SFA offerings, but those are limited to customers of those ERP systems. Its one standalone CRM product, Epiphany, is more of a marketing automation solution (and, in fact, will be the focus of a future product in the Inforce series). Finally, Infor now becomes an option for Salesforce.com's many CRM customers who are looking for ERP solutions. Because Salesforce does not offer a complete business suite, cross-referrals from Salesforce can be an attractive sales channel. What's in It for Salesforce? Though not immediately apparent, the benefits to Salesforce.com may be even greater. For further growth, Salesforce needs new channels. Moreover, with over 70,000 customers, Infor's installed base is a large market. In terms of ERP revenue, the No. 1 player (SAP) and No. 2 (Oracle) are both fierce competitors to Salesforce, leaving Infor (No. 3) as the largest available option. (Microsoft, also with a large ERP installed base, is likewise a head-to-head competitor with Salesforce.com). The more I think about the larger market dynamics, the more Infor appears to be a great choice for Salesforce. The fact that Salesforce is putting its money where its mouth is (i.e. becoming an Infor investor) is further evidence that Marc Benioff views this relationship as strategic. On a side note, Benioff will be speaking at the Infor's annual user conference in Denver this year, in April. Of course, Infor customers and prospects now will have an option to go with the market leading solution for cloud CRM. Furthermore, today's announcement of out-of-the-box integration will make the decision easier. Many ERP users choose Salesforce.com today, but I have seen first-hand that integration concerns do produce friction in the sales process. Salesforce and its implementation partners have some good answers for how they will handle integration, but generally each deal is a custom integration, raising uncertainty about the effort and cost. What Inforce Everywhere does, in my mind, is to make ERP the system of record for Salesforce.com entities that should be managed in ERP: customers, contacts, quotes, orders, shipments, invoices, payments, and returns. Most problems with ERP/CRM integration involve duplicate and redundant data. If Inforce Everywhere works as advertised, it takes away buyer concern about integration and offers a 360 degree view of the customer to users of both CRM and ERP. Although overall I'm positive about the Infor-Salesforce partnership, it's important to take a balanced view. So what are the potential pitfalls? I can think of several. Will Infor's direct sales and partner channel be eager to resell Salesforce.com? Selling traditional software licenses carries large up-front commissions and recurring maintenance revenue. Other traditional vendors have had a hard time making the transition to selling subscriptions. It's easier if there is a completely separate sales channel for cloud, but I haven't heard that Infor is planning that. If so, how will Infor overcome the inherent disincentives to selling Salesforce? Will Infor's customers really be a large market for Salesforce? The 70,000 customer number may be a bit misleading, as a significant percentage of those customers are on older versions of Infor products that will not be able to take advantage of Inforce Everywhere (which uses Infor's new lightweight ION middleware for integration.) Furthermore, Inforce Everywhere today is only available for Infor's LN (formerly Baan) and its distribution systems (A+ and SX.e). Infor's XA (formerly MAPICS), Syteline, and Visual are scheduled for Q2 this year, followed by S21, Sun Systems, LX, M3 (formerly Intentia), and Adage integrations later this year and next year. (Interestingly, I do not see Lawson's S3 on the roadmap that Infor shared with me last week.) When taken together, this means that the addressable market for Inforce Everywhere is less than meets the eye, at least for today. Will Salesforce.com customers choose Infor over other options? Infor is not the only ERP choice for Salesforce customers, and Salesforce's relationship with Infor is not exclusive for ERP. In fact, there are other ERP providers--notably Rootstock and Kenandy--that are built purely on Force.com. If one counts more narrow providers, such as FinancialForce and Glovia, the options multiply. With the exception of Infor's Syteline as a cloud-based offering, all of Infor's ERP solutions are traditional on-premise or, at best, hosted offerings. How attractive will these be to Salesforce.com customers that have made a commitment to cloud computing? Although there are several obstacles to success, I see great value in this partnership. Infor's customers now have an interesting and compelling way forward for CRM and for cloud computing generally, while Salesforce.com has a great opportunity to do an end-run around SAP and Oracle to gain mind-share with a large body of installed ERP customers. I look forward to hearing the experience of some early adopters of Inforce Everywhere at the Inforum conference in April. Me: Why are integrations so darn hard? CEO: Success is you both end up feeling equally screwed. Possibly, the best Cloud use-case is integration technologies, bringing about untypical tech industry partnerships.